I know I've filled a lot of posts with words about (and photos of) some of the more obscure additions to the Japanese GameBoy catalog as of late, but I'm also interested in this iconic handheld's more common titles, too. Two cases in point can be found in this very post. The first is the once-little-known game known as Mogurānya in Japan and Mole Mania elsewhere. In case you're among those who've still yet to hear about it, it's a cute little action game that was made by Nintendo EAD--led by the legendary Shigeru Miyamoto--and Pax Softnica, a for-hire development house that also helped produce Balloon Kid, Mother and Mother 2 (aka EarthBound), among other classic titles. Anyway, I've been meaning to pick up a copy of the Japanese version of this game, which was first released in that region in 1996 and elsewhere the following year, for some time now, but I only got around to it a month ago. I actually prefer this game's North American box art to the Japanese box art seen in the photo above, but I went with the latter option anyway because, as I'm sure you've guessed, I'm on a bit of a Japanese GameBoy kick at the moment. The back of Mogurānya's box is even less interesting than its front, if you ask me, although I do like this odd little illustration that's found in its upper-right corner. The game's cart label, on the other hand, is a completely different story. Just look at that adorable piece of art--how can you not love it? As for the second "case in point" that I alluded to earlier, Donkey Kong, well, what else can be said about it? After all, most folks consider it a classic, must-have GameBoy title--and, personally, I consider it one of my all-time favorite portable games. I also consider its box art, above, to be among the cream of the crop when it comes to Nintendo's first handheld system. Speaking of which, I've always wondered if this release's official name is GameBoy Donkey Kong. I mean, isn't that kind of what the cover art implies? Or did the designers at Nintendo of Japan just decide to slap a big GameBoy logo above the Donkey Kong logo for some added oomph--even though a smaller version of the same logo appears in the box's upper-right corner? I didn't snap and share any photos of this game's cartridge, by the way, because the label art's just a cropped version of the cover art. So, I nabbed a shot of one of the manual's pages instead, as some of them feature a nice mixture of illustrations and sprites, like the example above. I've always had a soft spot for that ladybug "enemy," by the way. How about you? Do you have any favorite enemies--or other aspects--when it comes to the GameBoy version of Donkey Kong, or even when it comes to the aforementioned Mole Mania? 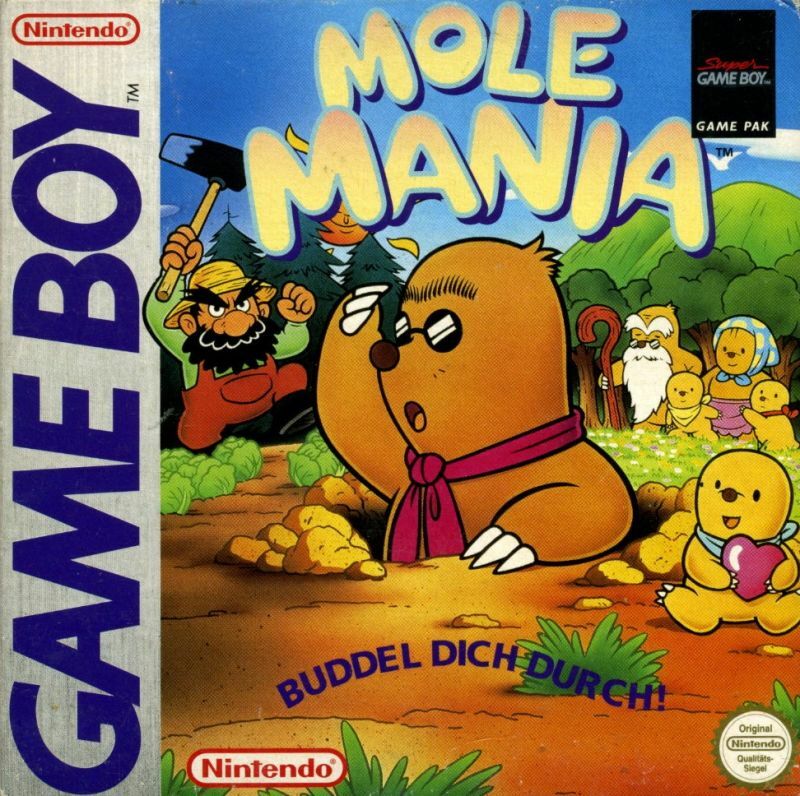 Mole Mania looks great on the Super Game Boy accessory for the SNES as well! Oh, yes, I'd love to see a reboot or a sequel to this game, Charlie, especially for the 3DS! Yep! As does Donkey Kong. Which reminds me: I need to pick up a Super GB pronto! I have both games in their European versions (as I'm living in Europe :-) and Mole Mania as a japanese cartridge as well. Both games are absolutely stunning - even today. Yep, I agree, Bodo! Both games have held up remarkably well, especially when you consider their age and the tech used to create/play them. I haven't played DK '94 in ages, but I do have Mario vs. Donkey Kong for the Game Boy Advance, and it's very faithful to that game. Shame about the computer rendering, though. You should get back to DK '94 when you can, Jess, it's so much fun--and adorable, too. As for Mario vs. DK, I have to sheepishly admit I've long ignored it because I just don't like how it looks. I like the aesthetics of the DS and 3DS Mario vs. DK games a lot more, though, so maybe I should give one or more of those a try sometime soon. It's a shame the games don't use the Super Game Boy enhancements for the 3DS Virtual Console. I always liked the color palette and "Help! Help!" voice clips in Donkey Kong.